7.7.1913: Launched by Cochrane & Sons Ltd, Selby (Yd.No.561) for Hull Steam Fishing & Ice Co Ltd (64/64), Hull as BRIDLINGTON. 1.9.1913: Registered at Hull (H1009). 1.9.1913: Joseph Vivian appointed manager. 6.3.1936: At Extraordinary General Meeting at Hull, Kelsall Brothers & Beeching Ltd placed in Creditors’ Voluntary Winding-up (Richard Field Helm of Messrs Hodgson Harris & Co, London appointed liquidators). 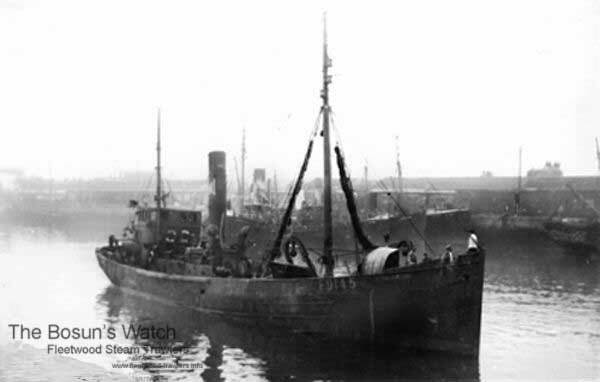 3.2.1937: Sold to Heward Trawlers Ltd (64/64), London (Robert Scott Hewett & Harold Frank Hayward) under mortgage (A). 17.2.1937: Robert S. Hewett, London appointed manager. 19.2.1937: Registered at London (LO194). Refurbished. To fish out of Fleetwood. 1948: Sold to Fern Leaf Co Ltd, Fleetwood. 1954: London registry closed. Registered at Fleetwood (FD145). 1956: Sold for breaking up in The Netherlands. 17(7? ).9.1956: Arrived Dordrecht from Fleetwood under own power. Fleetwood registry closed. This entry was posted in Steam Trawlers, Steamers (Picture) and tagged Fern Leaf Co, Heward Trawlers on January 26, 2009 by Fred Smith.